We have been in business since 1918, and we services all of Lanark County. We feel confident that we can cater to your needs. We get the job done and we don't just meet expectations; we exceed them. Our customers keep coming back because we're dependable, knowledgeable and pleasant to work with. We offer a wide array of services to suit your needs. No job is too big or small for us. We will be able to accommodate your every need. Contact us today at 613-267-3808 to find out how we can help you. It's our pleasure! In the agriculture industry, feed and farm supplies play a huge role in the success of a variety of agriculture based companies. From local farms, to agriculture production companies, landscapers and everyone in between, we are the leader in providing bulk landscape and feed in Lanark County. People come to us when they need feed, seed, and landscape supplies because they know we will have what they need when they want it! Our service offers extend well beyond offering feed in Lanark County. We offer a variety of services across the agriculture industry and serve everyone from local farmers, individual customers, and more. Our services include grain processing, farm feed delivery, soil sampling, seed sales, organic grain and seeds, farm fencing, bulk landscaping. Even though we are best known for feed in Lanark Country, we can help you out is so many ways! Each one of our products and services come with a high quality service guarantee. Our customers come to us for bulk landscaping materials and feed in Lanark County, but they come back because of the exceptional and personalized customer service that has helped us build our business over the past 4 generations. We offer a variety of wildlife seed and pet food too! Expect high quality customer service – guaranteed! Need Feed in Lanark County? Give us a Call! If you need feed in Lanark County you have come to the right place! 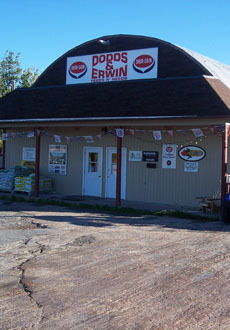 Dodds and Erwin offer a wide variety of products and services that will help you meet all of your agriculture business needs. Please don’t hesitate to contact us with your questions and inquired about our business and how we can help your business meet its needs.